Worlds connect, or worlds collide. 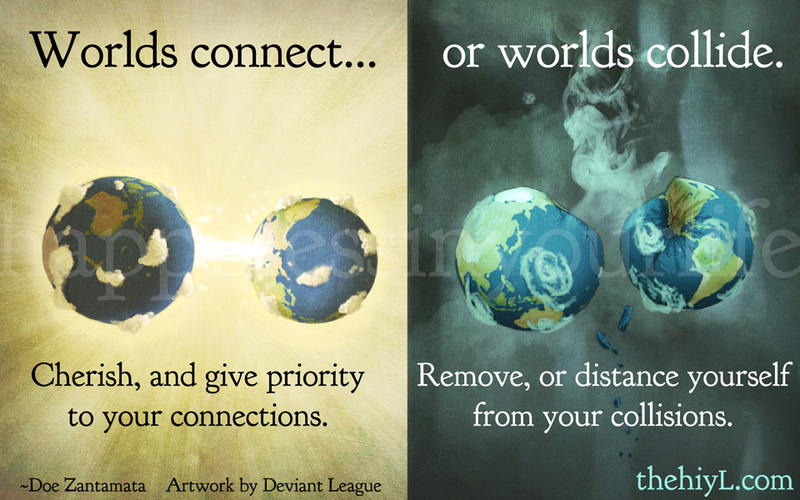 Cherish, and give priority to your connections. Remove, or distance yourself from your collisions. In each of us, a world exists. It is made up of all of our experiences, our family, friends, thoughts, hopes and dreams. When two worlds meet, it is either a connection or a collision. Connections are those who we find ourselves smiling when we just think of them. They brighten our days, and we brighten theirs. They encourage and inspire us to be the best versions of ourselves. They strengthen our other connections, as we become happier, more confident people. They strengthen us. Collisions do the opposite. The mention of their name can turn a smile into a frown, and cause an inner panic. They cast a cloud over the sunniest days. They discourage us, and the only things they inspire in us are doubts and fears. They bring out our insecurities, and make it very difficult for us to be happy around them. They weaken us. Those who you are connected to are not independent of your collisions. If you have a feud at work, when you come home or talk to friends, you share the effects of those collisions with your family and friends. They want to be there for you, but it hurts them to know that you are in pain. It hurts them. If you begin a volatile romantic relationship, it also stresses your connections. They may over time tell you that you’ve become a different person. You’re no different, you’re just choosing to be around a person who brings out the absolute worst in you, and it shows. Some relationships can begin as connections, but when they run their course of time, if we still try to remain in them, they change into collisions. Little things that used to go unnoticed become incredibly annoying. Words are twisted incorrectly, actions are misperceived. We feel that we can do nothing right. When we’ve left a relationship emotionally and mentally, but still remain physically, that relationship becomes a battle. We stay sometimes over nostalgia, remembering the connection that was once there. We stay sometimes because of loyalty, or habit, but not because we’re bringing out the best in each other. We’re not even able to be happy when the other is near. We sometimes view collisions as challenges, and we do most definitely learn a lot about our own self-worth and all of our hidden fears through them. But life was not meant to be a warzone. While we’re trying to mend the unmendable, we’re also breaking apart formerly strong connections with others. Once the major collision is finally gone from our lives, we wonder what happened to all of our other connections. At first they said they understood, but eventually, they did not anymore. In reality, we were the ones who stretched those connections past their limits, and eventually, they broke. Value and make your connections your priority. When you have collisions, look within to see what’s causing negative reactions and feelings inside of you, and try to remain detached and unaffected by the blows. Know when you should be treated better than you are, and know that you cannot convince someone who thinks you have no value into someone who thinks you do. It is not a reflection on you, unless you believe it, too. If you believe it, it will become your mission to convince them of your worth, at the cost of all of your other relationships. Even if you win that battle, you’ll realize that it was not a prize worth winning. Love and appreciate those who love and appreciate you. Realize the gift of being able to be yourself and have trust with people in your life, and make certain you keep those connections strong. They will share and lessen your pain when it’s unavoidable, but can’t be expected to understand why you’re choosing it in those times when it is avoidable. They want the best for you, and will also share your joys as if they were their own…without envy. They are your gifts in life. Make sure to always appreciate your gifts, and never take them for granted, or they will eventually be given to someone else. The time you make for your collisions will result in a life of unhappiness and regrets. The time you make for your connections will result in a life of joy and memories of happiness. 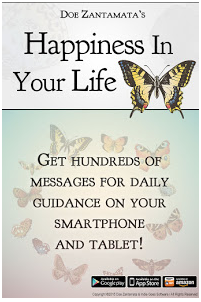 For daily inspiration, get the Happiness in Your Life app. Oh Doe, you are wonderful. This is so beautiful. It's particularly relevant to me right now as I struggle to let go of something that was once magical but has long since lost its spark. Thank you for this.